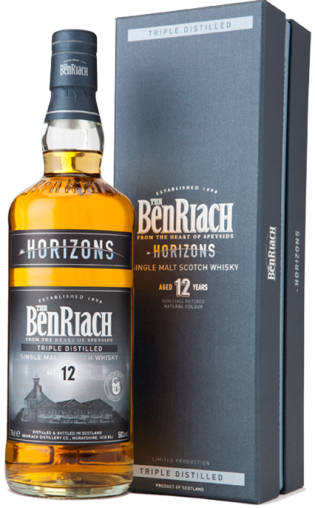 Horizons – the 12 year old, triple distilled BenRiach – is one of the most unique whiskies to be released by The BenRiach Distillery Company. 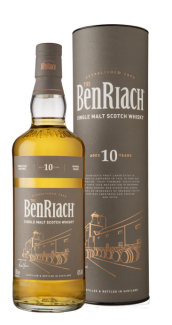 Traditionally most single malt Scotch whiskies are distilled twice, however during the late ‘90s, BenRiach experimented with some limited production runs of Triple Distilled whisky, and we have allowed the whisky to mature for a minimum of 12 years before giving you the opportunity to the sample the fruits of our labour. Roasted almonds and Brazil nuts. Hot, freshly buttered scones smothered in clotted cream. Sweet heather honey adds an extra luxurious contribution. Vibrant and wonderfully fresh. Huge nutty characteristics right from the start including peanuts, Brazil nuts and hazelnuts. A slice of sweet creamy oak and honey brings balance to the equation. Scotch Whisky, 43-46% Alc. 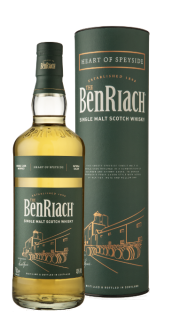 by Vol., Imported by Brown-Forman Beverages, Louisville, KY.
BenRiach is a registered trademark. ©2019 BenRiach. All rights reserved. All other trademarks and trade names are properties of their respective owners. Please do not share or forward this content with anyone under the legal drinking age.